His Eminence, Francis Cardinal Arinze will be celebrating a Pontifical High Mass in the Extraordinary Form at 7pm on Thursday 20th June. This Mass will open our annual Quarant’Ore, or Forty Hours’ Devotion, and the Blessed Sacrament will be exposed from the end of Mass until Midnight. Cardinal Arinze is the Prefect Emeritus of the Congregation for Divine Worship and the Discipline of the Sacraments and is Cardinal-Bishop of Velletri-Segni. He has previously served as the Archbishop of Onitsha, Nigeria, and participated in the Second Vatican Council. As is traditional during Quarant’Ore, there will be a Mass for Peace at 1:05pm in the Lady Chapel. Holy Hour led by Fr Alan Robinson, Rector of the Shrine. The Rt. Rev. Michael Campbell, OSA, Bishop Emeritus of Lancaster, will be celebrating a Pontifical Sung Mass in the Ordinary Form to close our Quarant’Ore Devotions at 12noon. This Mass will conclude with Pontifical Benediction of the Blessed Sacrament. 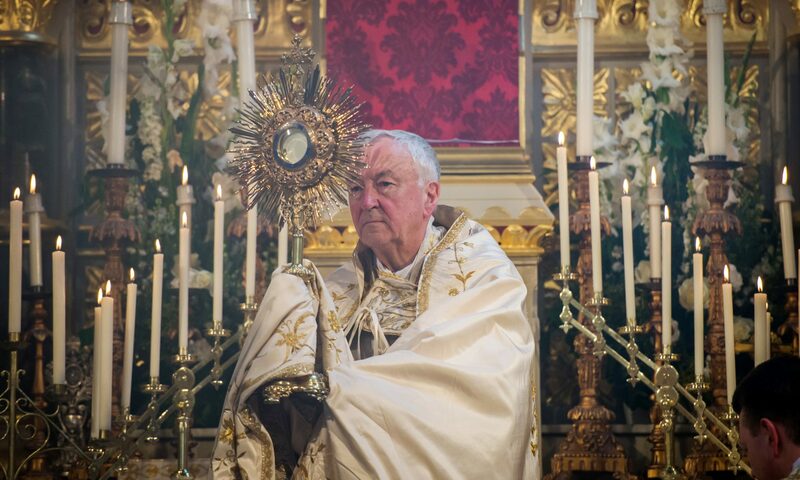 Fr Alan Robinson, Rector of the Diocesan Shrine of the Blessed Sacrament, will celebrate a Solemn Sung Mass of Corpus Christi in the Ordinary Form, which will be followed by a Procession of the Blessed Sacrament around Covent Garden. Please note that there will only be one Mass this Sunday at 11am – no 9:30am, or 11:30am Masses!